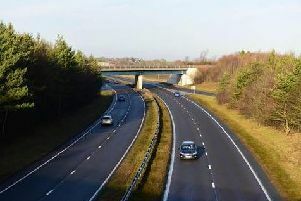 Police are trying to trace the owner or owners of two horses which were killed overnight on the A19 southbound carriageway. A member of the public rang police reporting the animals on the Wolviston/A19 roundabout at around midnight last night, but sadly before officers arrived, the animals had wandered onto the southbound carriageway where they were struck by a HGV. Police say it is possible that both horses were pregnant at the time as the bodies of two foals were also discovered at the scene. One of the adult horses was brown and white, the other dark grey with a white underbelly. The HGV driver was uninjured during the collision, however the carriageway was closed until 3.20am today to allow police and partner agencies to deal with the incident. Despite inquiries and the assistance of local farmers and horse owners, police say they have not been able to trace the horses’ owner/s and they have appealed for them to contact Cleveland Police via the 101 number, quoting Event 23718.